LimeSDR with Gqrx is working! Dang, I need to get my antenna array rebuilt. Missing satellite passes drives me nuts! I have also received parts of a NOAA-19 pass earlier today at 13:00 UTC. Raw and false color images below. 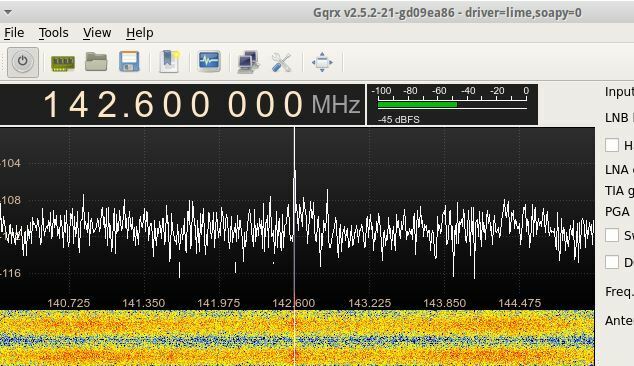 Record WAV file with gqrx using it’s built-in APT FM mode. Convert the WAV file to 11025 Hz mono using sox. Process WAV file with wxtoimg. 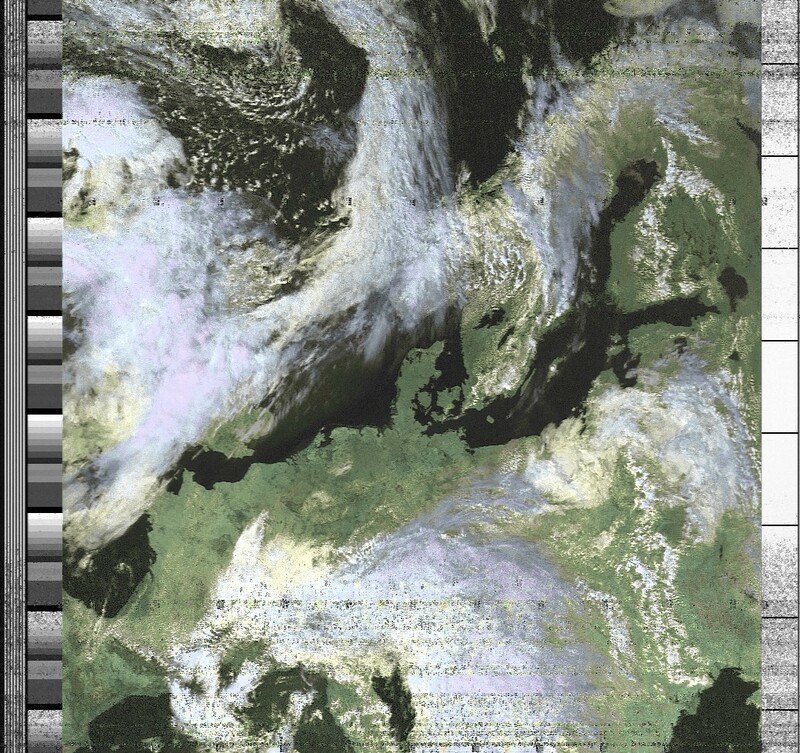 I am used to receiving significantly better APT images, but there was lot of QRM on VHF at this location and also this is a new device for me, so all in all I am very pleased with this first result. Can you let me know how to configure the SDR source for pothos? I was able to get some connection with the radio but will like to verify options. I haven’t used pothos so I don’t know. Maybe @joshblum can help. I have a windows with gqrx from pothos install package 2016.06.04 and LimeSDR USB 3.0, when trying to open gqrx it crash with the radio. Can you let me know which configuration you used for the driver? and also if you have a test flow-gram for GNU radio to check if my radio is ok? Yes, you have to use driver=lime,soapy=0 and manually enter the sample rate and bandwidth. Sample rates that work: 1.25, 2.5, 5, 10 Msps Bandwidths: 1.5, 4, 10 MHz Other sample rates will also work but I didn't try. There is no PPA for this specific project but there is PPA for gqrx, gnuradio and soapysdr + drivers. The PPAs should work on Ubuntu 14.04 - 16.04, but we still have to compile limesuite ourselves until we get it into the PPA with gnuradio and soapysdr. LimeSuite is undergoing development and bug fixes but I believe that the copy included with 2016.06.04 installer didnt have any serious bugs that would inhibit the use of the receiver in GQRX. For anyone else trying to get the LimeSDR and GQRX working on a Mac…it’s not possible…yet. (gr-osmosdr and gnuradio also) - and using ppa limesuite and soapysdr per http://wiki.myriadrf.org/Lime_Suite - LimeSuiteGUI now shows fft thanks to the uncheck “show this error next time” trick and I can see the local LTE tower, yay! I take it we need to build limesuite ? @cswiger is that regardless of frequency and gain settings? There have been updates to Lime Suite which have not yet made it into binary builds, so worth building source from master to get them. Yea, that’s going to open up the whole can of worms of all the different dependencies and their constantly changing versions that plagues gnuradio build from source - will try to get time to see what version of wxWidgets-dev I’m missing. and now it appears happy. rebuild gr-osmosdr and gqrx, Annnnnd w00+! Glad to hear you are up and running, @cswiger! Would appreciate it if you could test also and HF and let me know how you get on. @cswiger Any particular reason why you are building version 2.5.2? Why not the latest version? Thanks! just upgraded and now enjoying local FM radio stations. Glad to hear the latest version is also working. I haven’t tested LimeSDR integration for a while. I think the Pothos github fork is used to fix windows build issues and so probably only updated when Josh needs to send me a patch. Sorry @nn4f_radio, I have no clue regarding running gqrx on windows. If you can launch it from a terminal there may be some error messages that could give a hint.